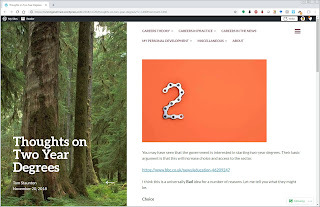 A fellow career practitioner, Tom Staunton, wrote a blog post on the UK Government's proposal to introduce two year degrees (Coughlan, 18 November 2018). Tom was worried about this shift from three perspectives: that the 'more choice' rationale provided by the UK Government had no evidenced outcome value; that the 'saving money' argument ignored other ways of cost reduction; and that completing a degree more quickly may not improve - or even maintain - quality (20 November 2018). One element of the article focused on institutions not being able to cope with the shift two two year programmes. We shouldn't really be worrying about the mechanics: let's put the learner at the centre of this. The article (Coughlan, 18 November 2018) suggests that the proposal is to turn around the lack of mature students undertaking degree study: "Condensing a full degree into two years is seen as being more appealing to people who are in work or with family commitments", so students would complete the same credits but whack it out in two years. I almost laughed out loud when I read that. The UK Government's solution for busy, over-committed people is to load them up with even more stress by increasing their study load. I find students are already stressed in their study learning at the present rate, how is it safe - or how will it provide better learning outcomes - to increase those stress levels? I left a comment with Tom telling him that I agreed with him. I too think that two year degrees are a bad idea. This proposal may white ant the value of a degree, or at least start employers questioning what degree people did and how long the programme was, creating a two tier employer view of undergraduate qualifications. In New Zealand we have a two year diploma and a three year degree. I have noted that there appears to be a difference in mindset between the diploma students and the degree students. I find that diploma students are less aware of their own shortcomings and more certain of their own judgement. Further, they are taken much less seriously by employers with a diploma rather than a degree, and so are less employable. Interestingly, in some cases we have just reduced diplomas to an eighteen month qualification. Perhaps we too are getting ready to propose a two year degree in New Zealand. Moving to a two year degree would worry me as there is something that changes or shifts - I feel - for students when they move from a two year programme of study to a three year programme. I think that extra year adds an ability to reflect on their programme of study and to professionalise their learning. Education should not be a force-feeding process. It should be more like the slow food movement. In my view, I think students need more time to think, to develop ideas, to construct argument, to explore and discount fallacies. Because a three year programme appears to change graduates, monkeying with it should be explored with caution. I would like to see research showing graduate benefits from both lengths of study before we dive in and make changes. This discussion needs to be entirely about the learners and how better learning takes place. If you are interested in reading a bit more of my thinking in this area, check out here, here and here. The latter article was inspired by an earlier blog post of Tom's.